I thought I’d post about a common problem in 3D art, and what I have done to solve it. 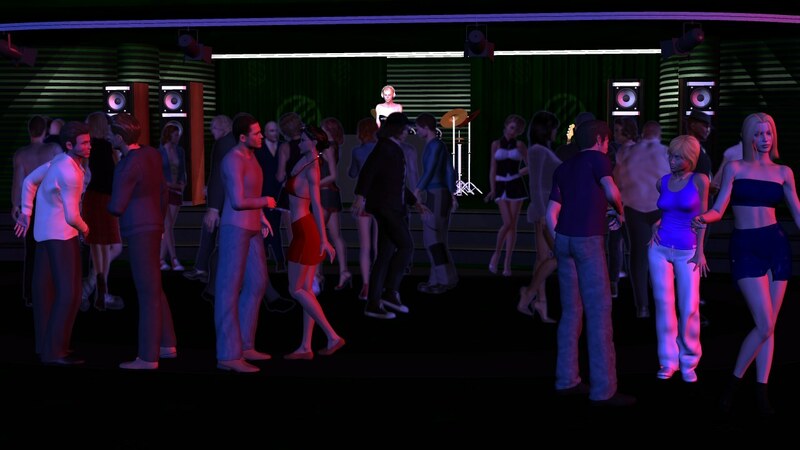 It is called the “crowd problem” and has been a difficulty with all 3D animation. The first 3D animated movie Toy Story solved it by never having any crowd scenes. AntZ, the second 3D animated movie had hundreds of ants doing the exact same thing which is easier than in A Bugs Life which had dozens of identical ants doing completely different things. 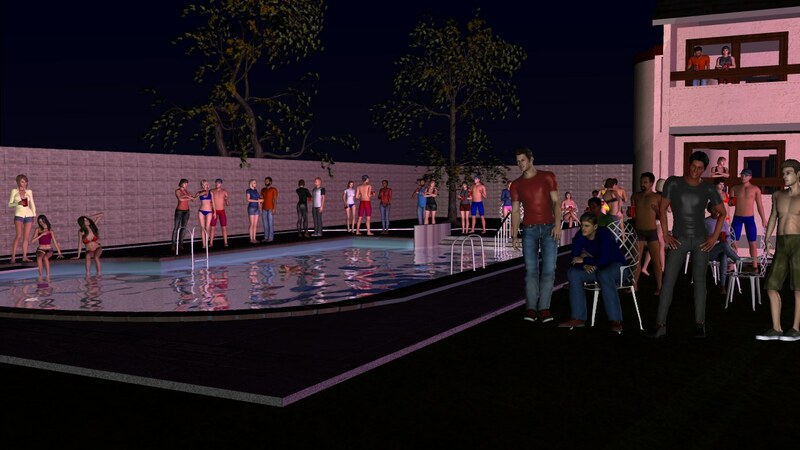 In the Date Ariane game, this was the biggest crowd scene in the game, consisting of 8 high resolution characters. The giant gap in the middle was filled in with Ariane, and that creepy guy who tries to fondle Ariane on the dance floor. The absolute maximum of high res characters I can produce at one time is five, and I have already posted a few pics from Something in the Air with five people in it. The above pic was produced by rendering the four people on the left and the four people on the right seperately, then combining the picture. This is a very time consuming process however. Date Ariane supposedly takes place on a weekday when places are not so busy, SITA takes place on a Saturday, and every place is crowded. I need ways to shortcut. The solution is a tool that generates generic crowds for you called M.O.M Crowd Generator. It throws in flat panel images of people walking or standing which can fill in a background crowd fairly easily. The primary issue I have using it is that all the people have a white outline around them like older movies when they did green screen effects. A little blurring makes the outline less noticeable, and since they are background characters, I can hide them with high res foreground characters. Notice that the front characters I’m using are the exact same I used in Date Ariane (even the exact same poses). Much of this crowd will be hidden by 4 to 5 characters in the immediate foreground. 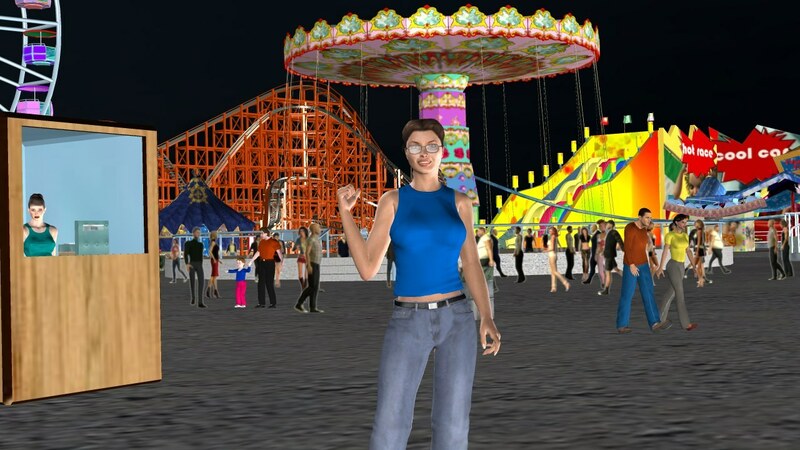 One of the places you can take a date in SITA is the amusement park. The same amusement park in Date Ariane. If you compare this picture with the Date Ariane one, you will find the main difference (besides the obvious different character in the foreground) is the M.O.M generated crowd in the background to make the place look a lot busier. The props and the high res characters are identical in both. 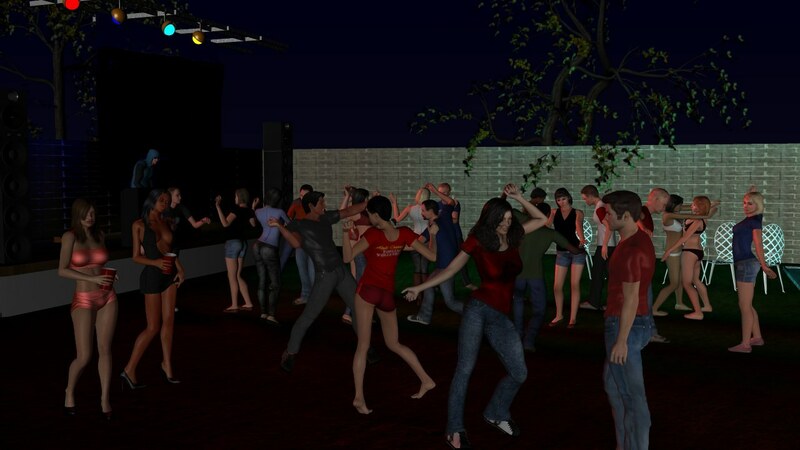 Another crowd scene is the above mentioned house party scene. This requires a better crowd than the M.O.M tool can produce. Especially since I wanted most of the crowd to be holding the traditional red Dixie cups you see at all of these house parties. I still have two more big crowd scenes to create, one on a beach during daytime, and one in a ComicCon type setting with a lot of costumed characters. So back to work. really great, man! i was loosing interest, but now i thin it might be worth the wait! Rachel looks just as gorgeous here, and I can’t wait to see how that dance scene plays out. There’s some great work going on here! That crowd tool is very clever! 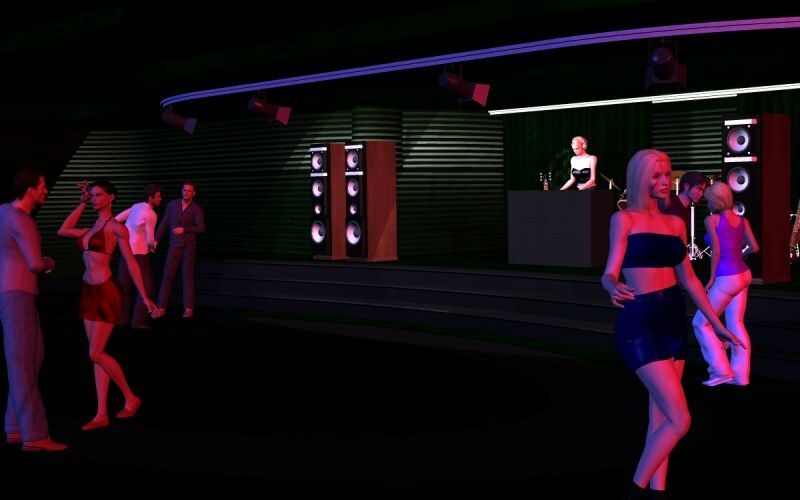 The nightclub scene in particular looks very organic, great stuff!